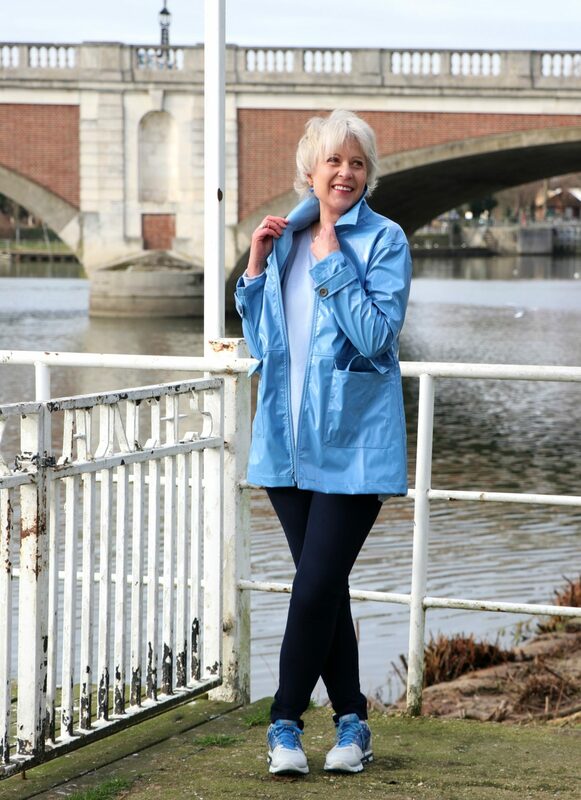 Today I am talking about Spring raincoats. Finally, the daffodils are beginning to show their golden heads and the days are starting to get longer. At last, for this year the skies have been so grey in London that I think I have been suffering from a touch of SAD (seasonal affective disorder). This can occur when you are not exposed to sufficient light during the Winter months. 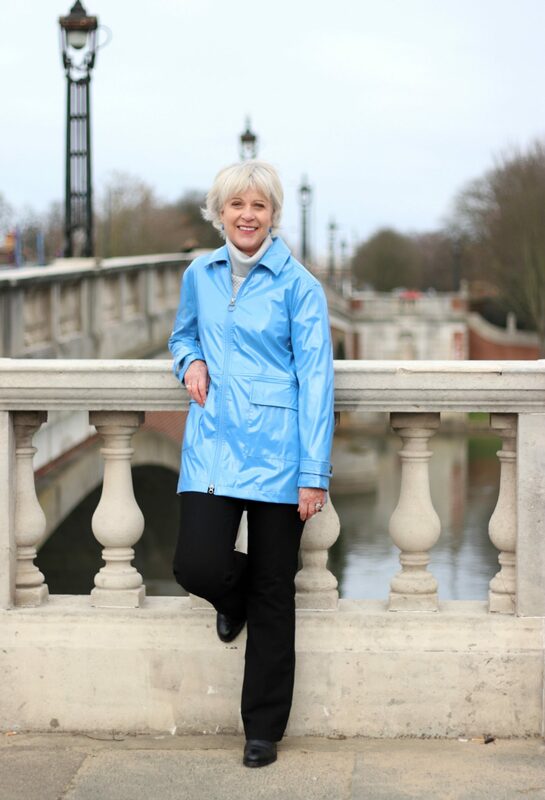 My new sky blue Spring raincoat is from Land’s End. It is such a gorgeous colour that it makes me want to sing in the rain. My Nike trainers are a few seasons old. You can see my selection of new Spring sneakers here. In my opinion, the raincoat is an essential item in all our wardrobes. I usually go for a neutral colour such as navy or grey. However this season I am really yearning for colour. Possibly it is a reaction to the dark skies. 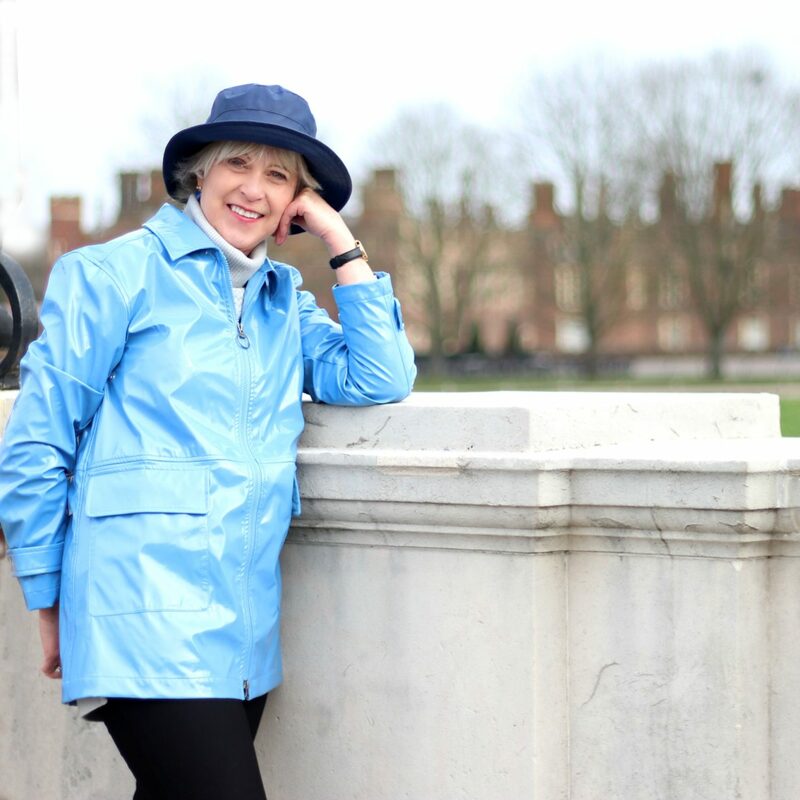 After a considerable amount of research, I found this gorgeous sky blue raincoat at Land’s End. It is water repellant and has a shiny coating, which I like. Navy rainhat (a few years old) similar at Land’s End and John Lewis. Umbrella similar John Lewis Navy leggings Winserlondon and blue sweater WoolOvers (nearly sold out in this colour, other colours available). I understand that you may not be a fan of shiny so I have selected a variety of styles in bright colours and others in the more classic neutrals. Brilliant timing Josephine, I’ve just started to look for a spring raincoat and fancy something bright and cheerful. I love the blue. I love that raincoat, Josephine! I’ve been thinking about getting one in a brighter color too. Where did you get the scarf from Josephine? It looks a decent size and soft, lovely colour too. The scarf if one of my St.Tropez market purchases. I will see if I can find something similar. I got the red flowery one in the sale at Joules. Navy is always my basic holiday colour and it will be fine with dark jeans and the navy jersey trousers which are so comfortable for travelling. I love the colour of your Josephine but a bit above my budget for one item! I would like your advice about the size of the Guernsey jumper that you bought in the Me+Em sale. I am a 10/12 and wonder if I should buy the smaller or larger size. I have bought two pairs of size twelve trousers which I love and they are perfect, but I am smaller on top and wonder if the larger size jumper would swamp me. I am 5ft 6in. Thank you. I really appreciate the advice on your blog. When I visited the Me+Em shop I tried on both the 10 and the 12. The 10 fitted me well however I chose the 12 as I wanted to accentuate the oversize look. I think we are about the same size I normally take a size 10 top and 12 bottom and am 5’7″. You could always order both sizes and try them on in your own home. They have free returns but are a bit low to process the refund. I often do this if I am unsure otherwise you have to pay two lots of P&P. Thank you Josephine. I think I’ll go for the size twelve. It’s the only one left in the green colour anyway which is the one I had my eye on. I think I received the very first Lands’ End catalogue years ago. They always have a great color selection. I also like that they carry petites and have reasonable prices. Love your blue raincoat, Josephine, especially the colour. I have just purchased a Lands’ End (US) Essential jacket in navy for the Spring (I live in Ontario, Canada). As with most of their jackets/coats, it is available in petite and is a perfect fit. Good quality for a reasonable price. Daffodils in February! I’m terribly envious! On the other hand, I ordered snowshoes today, so I don’t want our snow to melt away until I’ve had an opportunity to try them out. The sky blue looks lovely on you.